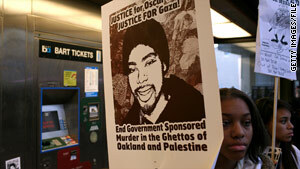 Demonstrators in Oakland, California, protest the police slaying of Oscar Grant in January 2009. San Francisco, California (CNN) -- Officials have agreed to pay $1.5 million to the daughter of a man fatally shot in the back by a transit police officer on New Year's Day 2009 in Oakland, California. A bystander's cell-phone video of the shooting on a transit platform was widely circulated on the Internet and on news shows. "It's been a little over a year since we experienced the tragic death of Oscar Grant," BART Board President James Fang said. "No matter what anyone's opinion of the case may be, the sad fact remains this incident has left Tatiana without a father. The $1.5 million settlement will provide financial support for her." Grant's daughter, Tatiana, is 5. The video showed then-Officer Johannes Mehserle, 27, pulling his gun and shooting Grant in the back as another officer kneeled on Grant. Mehserle might have intended to draw and fire his Taser rather than his gun, according to a court filing by his attorney. The shooting sparked large protests in Oakland and led to Mehserle's arrest on a murder charge. The case against him is pending. Initially, attorney John Burris asked for $50 million in a wrongful-death lawsuit filed on behalf of Grant's daughter. Burris was not immediately available for comment on the settlement. The transit system's police department has made several changes since the shooting. The department has increased training hours for officers, is requiring them to report all "use-of-force incidents," and is tapping the public's help in searching for a new police chief, the transit system said in a statement. "This settlement is critical in our efforts to move forward," said Carole Ward Allen, a BART board member. "We're working hard to make the police department the best it can be for our officers, our customers and our community."